Sheet sizes: 7.1"x10.1" to 11.8"x17"
Corner and Side Stapling in a Space-Saving Design: The Optional Model PS-P61 provides corner and side-staple options to a single 10-bin QC-S Collator. Add Face Trimming: Increase the professional appearance of every finished book without sacrificing productivity by adding the optional in-line face trimmer. 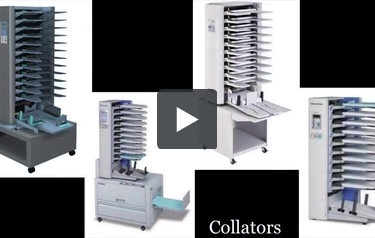 This is MyBinding video.If you’re in the market for a collator, we have them small and tall. We have selections from Martin-Yale, Standard and other companies. And whether your project is a small in-house job or a really large industrial sized job, we have what you need. You can click around on our website and find descriptions for everything, and give us a call. We love to answer the phone and help you find exactly what you need. All of these collators are sure to allow you to quickly and easily assemble your documents in no time at all. When image matters, MyBinding.